The other evening I was watching the TV show, “NCIS.” It was the episode in which the origin of many of Gibbs’ Rules was explained. His rules are an extensive series of guidelines that Leroy Jethro Gibbs lives by and teaches by. One of the rules even applies to Santa Claus, which started me thinking about communications and leadership lessons from the North Pole. Teamwork is important. Rule 15 states “Teamwork is important.” For Santa to get all the presents made and delivered, he needs a team of elves and they need to work together to succeed. Gibbs was reminding his team of the importance of working together to solve a case. Letters work. Each year boys and girls – both naughty and nice – take pen, pencil, crayon or marker to paper to plead their case about how good they have been and what gifts they would like (and deserve). Some children are texting and emailing, but letters remain the most popular way to reach Santa. The USPS even has a program to handle the volume. If you do hear back from Santa and want to share your letter with others be sure to tag it #SantaLetters. Are you capable of change as fast as the world is changing? What case do you make for the difference you make in your role? Are you regularly able to reinvent yourself? 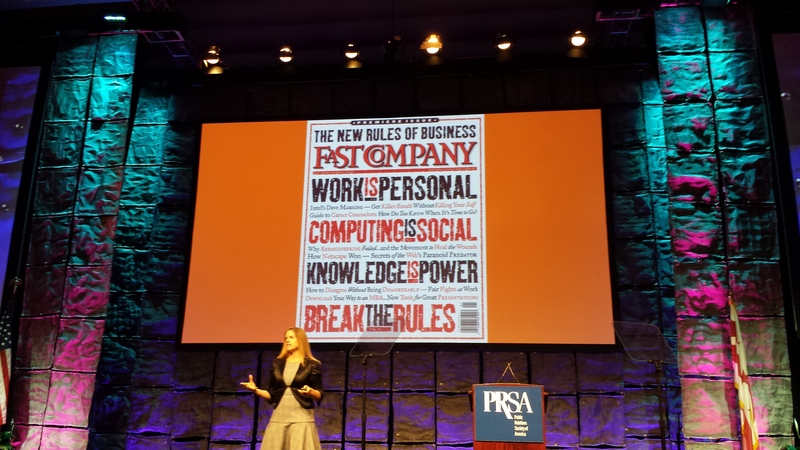 Those were daunting questions asked by Polly LaBarre, a founding member of Fast Company and the editorial director of MIX. Her advice is not to be afraid, but rather to develop a sense of energy. Stand for something. The values you stand for will imbue your organization. Your job is to be alive and awake to the shifts, but you also need to know what shouldn’t change. Articulate and advocate for a better future. If they are telling it for you, they most likely are on social media. Lead without authority. The ruling idealogy for so long was “control” but that doesn’t unleash passion and inspiration. Have you developed your sense of energy? In Sheryl Sandberg’s book Lean In she talks about the importance of sitting at the table. I had been meaning to read the book for some time, and I’m glad I finally made the time, if only for this point. She encourages individuals, women in particular, to not wait to be invited to sit at the table. She cited an example of an important business meeting where a few women sat off to the side. That also meant they were not included in the conversation and the decision making. If an agenda is available ahead of time, I review it to determine the areas where I might best contribute. Another way to think about being seated at the table, is to not wait to be told what to do. To succeed, Sandberg says, it’s important to seize opportunities and make them fit for you. In my last position, I seized an opportunity to develop the organization’s social media strategy and jump start it. It was a great learning opportunity, and has proven invaluable as I now have more communications platforms available to share content. Through NFPW and other organizations I have seized opportunities by volunteering for positions that not only helped me gain new skills, but also provided me with leadership roles. The holidays are a great time to tweak your career or prep for a career move as I recently wrote. I also find the holidays to be a perfect time to catch up on all the books I have been meaning to read. My list is longer than I would like at the moment because I have attended meetings and listened to TedTalks where speakers referenced books or had written a book. I’m sharing my list in case you are looking for inspiration. Thrive by Arianna Huffington. This is the first one on my list, and yes, it’s by the founder of the Huffington Post. She makes a compelling case on the need to redefine what it means to be successful in today’s world. She wrote it after she fell from exhaustion and broke her cheekbone. The Innovators by Walter Isaacson. If you want to know how innovation happens and what role disruption plays, this is the book to read. It tells the story of the people who created the computer and the Internet. Lie Spotting by Pamela Meyers. This book focuses on how to become a lie spotter, which can lead to truth seeking and ultimately to trust building. I watched a TedTalk and was fascinated by what she shared. Mavericks at Work by William C. Taylor and Polly LaBarre, who is a co-founder of Fast Company, one of my favorite magazines. The authors write that the only way to stand out is to be truly original. You can be inspired by the companies and people profiled in this book. What books would you recommend? Feel free to post a comment with the title and why you recommend it. I have a confession: Sometimes I put things on my To Do list that I’ve already done just so I can cross them out. It makes me feel good. I was thinking about that on a particularly busy day at work. I decided that what I really need is a “Done List,” a list of everything I have done that day. So I tried it. At first, it was a bit difficult. I’d finish something and move on to the next thing, and I had not added the first thing to my Done List. To be honest, the first day I tried it, it was day’s end before I added anything to the list. Each day it became a bit easier. I became more mindful of what I needed to accomplish each day. When I added it to the Done List, I gave myself a moment to recognize and acknowledge that I had accomplished something. It felt good. Of course, sometimes reading the list at day’s end exhausted me. I had no idea how much I did in a day, both at home and at work. It was good to see that even when things remained on my To Do list, I had achieved much on my Done List. I also discovered that sometimes I did things that I didn’t need to do on that particular day. I became more aware of how I used my time on any given day. I also recognized that the work week is 40 hours long and that I don’t have to do everything in the first eight hours of the week. So today, instead of making your To Do list, create a Done list. I bet you will feel great about the day! Reflect: Think back on the past year about your accomplishments and then update your resume. Did you learn a new skill? Receive recognition? Complete a big project? Add it to your resume. Once you have done that, do the same on LinkedIn. Connect: This is a great time of year to send a short note to someone and update them on what you have been doing. Even better, provide that person with information that would be useful to them. I recently shared with a former colleague who is interested in improving her Twitter skills about a great online class I took in just that area. If you are job searching, be sure to have business cards with your contact details and areas of interest to share when you meet someone. Shop: Yes, I just wrote that. If you have not updated your wardrobe in a while, take advantage of the sales and give your professional wardrobe and upgrade. If you wear glasses and haven’t purchased a pair in a few years, it’s time for new frames. Learn: Download a book or visit your library to find a book on a topic that could help your career. In an upcoming post, I will share what’s on my list. My goal is to finish one during the holidays. Relax: Sometimes the best way to help yourself professionally is by taking care of yourself. Schedule time to sit quietly and be mindful of all that you do have.